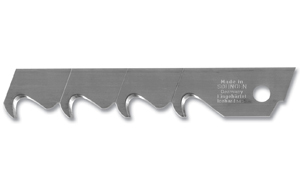 The Snap It ‘N’ Trap It auto-lock utility knife was developed for professionals looking for a safe and convenient way to snap and store used blade segments. Featuring a convenient detachable built-in blade snapper/disposal container in a heavy-duty ABS plastic handle. 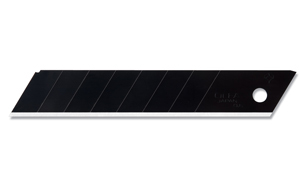 The storage container holds up to 16 blade segments for on-the-go snapping all day long. Simply slide the blade disposal container off the knife, insert the dull blade into the end of the container and snap it off. 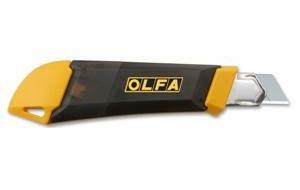 OLFA Blades LH-20B Model 9005 18mm Are Heavy Duty Snap-off Hook Replacement Blade. 5 per pack. CLICK ON IMAGE AND SCROLL DOWN TO RELATED PRODUCTS FOR A LIST OF CUTTERS OR KNIVES THESE BLADES WILL FIT.